Much eighteenth century music – especially in the hothouse of London – has a relatively short life. So means were needed to regenerate interest, bring in more money and, perhaps not least, to explore music re-scored, transposed and/or re-arranged in new lights. Of course, Handel often borrowed from his own sources. Indeed material from these sonatas can be found in his Op. 4 organ concerti, Op. 7 and Scipione. In this case it’s The Brook Street Band (Tatty Theo and Carolyn Gibley) who have ‘recycled’ six Handel recorder sonatas for cello and harpsichord – really only by transposing them and rendering them performable by cello and harpsichord continuo. Although he chose not to compose solo cello sonatas or concerti, Handel clearly loved the cello … some of his most sonorous melodies – in The Ode for St Cecilia’s Day, Alexander’s Feast and Il Penseroso ed il Moderato as well as Arianna in Creta - were for that instrument; and the cello was used to evoke the human voice. The reason for this gap in Handel’s output is as likely to be that such compositions for the instrument were not fashionable during the earlier part of his career, when most of his other solo sonate were written. 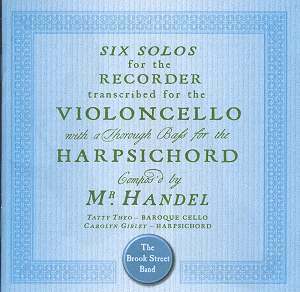 Since the original recorder pieces were written for accompaniment by harpsichord (or bass violin), Gibley’s retained role in these arrangements is explained. The Brook Street Band’s intention anyway was that there be more of a duo feel to the performances. There is, and it works quite well; the harpsichord is certainly forward miked and may be a touch insistent to some listeners at times. Theo also describes how the harpsichord part could well have been played by women in Handel’s time; the more demonstrative bodily movements of the recorder being considered indecorous. More evidence of that competitiveness in London in the middle of the eighteenth century comes from the rather tortuous publishing history of these Opus 1 pieces. The sonate are highly likely to date from around 1725, by which time Handel was well established in London; although the composer seems to have assembled them for publication in about 1730, the first edition - actually of a dozen sonate - was put out by John Walsh without Handel’s permission – and under the imprint of the recently deceased Dutch publisher, Jeanne Roger. This was probably done (and not for the first time) to force Handel into agreeing to a ‘second’ edition. This he did, making some additions and changes. Four of these sonatas were marked for playing by ‘flauto’, as the recorder was known then; and a fifth for ‘traversa’ (flute). The latter also appears in the set known as the ‘Fitzwilliam Sonatas’: the manuscript is housed in the Fitzwilliam Museum in Cambridge. There is a sixth in that same collection as well. This second Fitzwilliam sonata, HWV 377, is the only piece on this CD to have but three movements. Of the rest three are in the four-movement ‘da chiesa’ format; the other two have extra dance movements. On the whole the paying of the two-person Brook Street Band is expressive and lively, if a little ‘contained’ at times: more spontaneity and extroversion would be welcome. Those aren’t always missing, though: listen to the spring in the second allegro of the F Major to hear an almost singing – certainly a danced – step. Inevitably, perhaps, the cello has a distinct, woody tone; the resulting firmer (never heavier) touch which the music gets can become a tiny bit oppressive after a while. The instrument is an original by Joseph Hill, 1741 so almost exactly contemporary with the sonatas’ composition; Gibley’s harpsichord is after Mietke, 1710, by Alan Gotto from 1990 and conveys the cleanliness, airiness even, of the colour surely intended by Handel when these sprightly and tuneful pieces were originally written. None of this really spoils the impact made by this music and its persuasive and technically brilliant advocates here. Just that some portions of the faster music - both allegros from the D Minor sonata, for example - are more convincing than others. There are multiple recordings in the catalogue of the sonate in their original versions and such discs as Alan Davis and David Ponsford (Guild 7301) from the middle of last year should not be missed – at least for comparison. This CD is recommended. It’s something of an artefact: the colour of the music is inevitably darker than when recorders are used. One tends to concentrate on the melodic line more as a result; and on the superbly deft harpsichord playing. The whole is pleasing, very pleasing – a meal with sauces, perhaps, rather than ‘dips’, though the ingredients are the same. Varied tempi, telling pauses and communicative phrasing all contribute to making this a nice little set which will grow on you as you enter into the spirit of it.